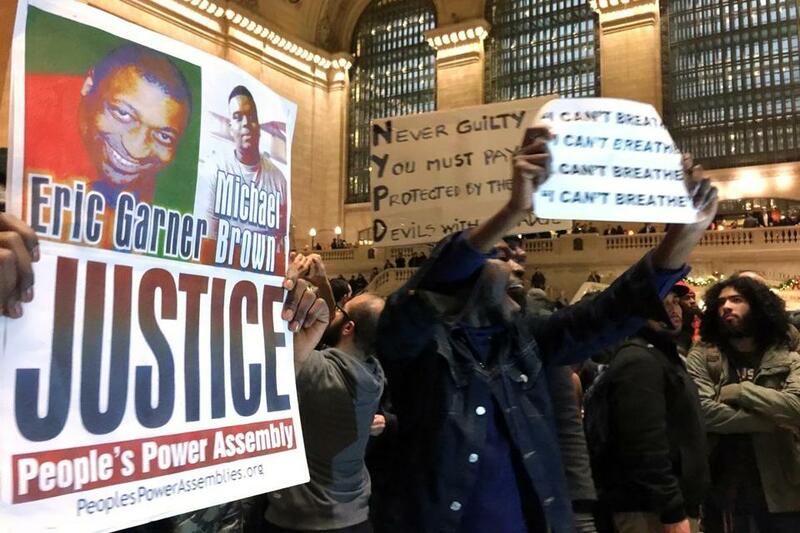 People protested in Grand Central Terminal after it was announced that the New York City police officer involved in the death of Eric Garner was not indicted. One week after a grand jury in Ferguson, Mo., opted not to bring charges in the shooting of Michael Brown, another grand jury — this time in Staten Island, N.Y. — decided not to pursue its case against a white police officer whose choke hold killed an unarmed black man. These are two different cases in two different states but the results are similarly controversial. Already, there have been protests in New York and Washington, and another Thursday night in Boston, continuing the pattern of nationwide protests over the Ferguson decision last week. Even without the echo of Ferguson, the Staten Island case would surely have attracted attention, but now both are part of a discussion about race, police tactics, and criminal justice. If you’re wondering how similar these cases really are, what happened in Staten Island, and how often grand juries dismiss charges, here, according to published accounts, is what you need to know. 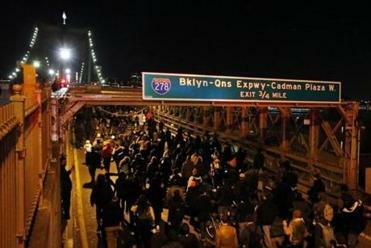 What happened in Staten Island? A man named Eric Garner was allegedly selling black market cigarettes on the street when he was approached by New York police. As part of the effort to handcuff and arrest Garner, an officer named Daniel Pantaleo placed him in a choke hold. Garner was brought to the ground, where he repeatedly told the officers, “I can’t breathe.” He later died. Did the choke hold kill Garner? A grand jury decided not to bring any charges against the officer involved in the Eric Garner case. The medical examiner ruled the death a homicide, citing both the choke hold and the force applied to Garner’s chest. A history of asthma and high blood pressure made Garner especially vulnerable. Choke holds have been banned by the NYPD since 1993, according to a variety of news outlets. Just because Garner’s death was ruled a homicide doesn’t necessarily mean it’s a crime. It’s up to detectives, prosecutors, judges, and jurors to make the complex decision about whether a case like this should be brought to trial and, ultimately, what the punishment should be. So why didn’t the grand jury choose to indict him? We don’t know. Grand jury testimony is generally sealed and any leaks can be grounds to restart the entire process. It’s true that information from the Michael Brown case was released to the public, but then virtually everything about that grand jury was unusual. Did the grand jury see the video? Yes, the grand jurors did see the video, and it didn’t sway them. That, alone, may be bad news for proponents of police body cameras — including President Obama, who has supported the idea of providing 50,000 such body cameras to police departments nationwide. The NYPD is currently introducing body cameras as part of a pilot program, and departments across Massachusetts are considering the idea. In Garner’s case there was no body camera, but there was clear video footage, yet the outcome remains controversial. Do grand juries often rule against further prosecution? No. The news site FiveThirtyEight.com looked at federal cases (which this isn’t), and they found that of the 162,000 cases brought in 2010, grand juries voted against indictment just 11 times (.007 percent.) Similar numbers for nonfederal cases are hard to get, but grand juries do seem generally inclined to support indictments. The big exception involves police. Again, there’s no definitive data, but various investigations have found that when police are accused of wrongdoing, getting a grand jury to support prosecution is far harder. That may be because police officers are especially trusted members of the community, and it may also be because prosecutors are reluctant to vigorously pursue cases against people whom they rely on every day. Grand juries aren’t like normal juries. They don’t decide whether someone is guilty, they just have to determine if there’s enough evidence to bring them to trial. They also follow very different rules than you’re used to seeing on television or in movies. Among other things, their work is generally not overseen by judges, the only lawyer is the prosecutor, and jurors can look at a much wider universe of evidence than would be permitted in court. The reason it’s called a “grand” jury is because it generally has more people than a trial jury (“grand” is French for big). Generally, grand juries have 16-23 people, whereas trial juries include 12 at most. Does this mean the Garner case is over? Garner’s family could bring civil charges against Pantaleo, seeking damages rather than prison time. In a civil trial, you don’t have to prove your case beyond a reasonable doubt. You just have to show that you are more likely to be right, and that makes it easier to win. Also, Attorney General Eric Holder has already said that the Justice Department is pursuing a civil rights investigation, though the bar for a successful prosecution on those grounds is extremely high. What about outside the courtroom? As with any protest movement, it’s hard to predict if it will spark change. But here’s one reason to think it might. Whereas the muddy circumstances around the Michael Brown shooting helped make it a divisive issue, the Garner video gives people a common vantage, which could bring them together in search of changes or reforms, including stricter rules against choke holds, a reassessment of body cameras, or a requirement that police consistently report fatal incidents. @globe.com. Follow him on Twitter @GlobeHorowitz.